Rhizome | Blog Posts tagged "archives"
To address these issues, Rhizome's Digital Conservator Dragan Espenschied used Colloq, a tool for creating contextual archives that was developed by Rhizome in partnership with Ilya Kreymer in 2014. 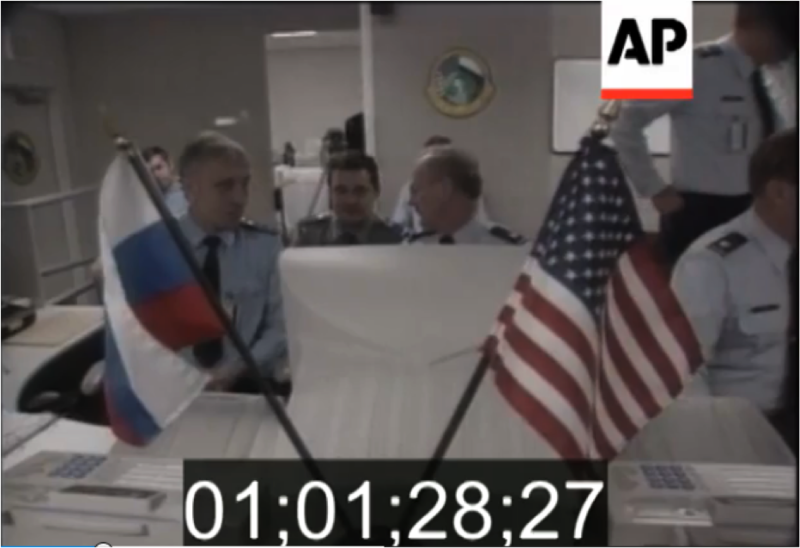 (The service builds on Kremer's pywb tools; you can read up on the technical details of of capturing the web video here.) Colloq offers a robust solution for this long-standing issue; with VVork as a test case, we have created a stable archive of the site including nearly all embedded video. Laura Davidson | Thu Dec 26th, 2013 2:30 p.m. 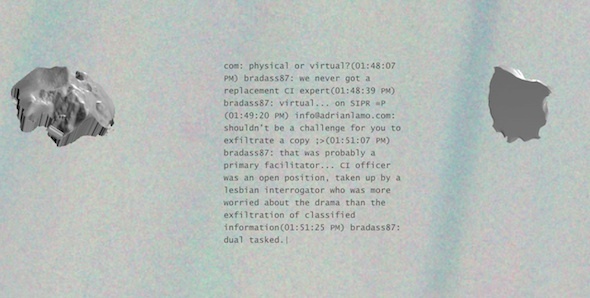 Through the prism of the 1991 attempted coup d'état in Russia to bring down Mikhail Gorbachev's government and restore hard-line Communist Party rule, Yuri Pattison's newest work, RELiable COMmunication, repositions 2013's defining story: Edward Snowden's revelations about the U.S. National Security Agency's global surveillance operations. Ben Fino-Radin | Thu Oct 6th, 2011 3:24 p.m. I wanted to take a moment today to briefly talk about an innovation in digital imaging and computing that has become a frustation to many artists that have been experimenting with the web since the early years: Anti-aliasing. Put simply, anti-aliasing is a method of image processing that uses interpolation, to construct "new data points within the range of a discrete set of known data points." This is a function of digital signal processing that has many many important applications, from helping typefaces look good on screen, to making images not look odd when scaled down. The use of anti-aliasing that we are talking about here though, is quite specific: the display of resized digital images and video in web browsers. To illustrate how anti-aliasing has affected an era of web content, we will look at Cory Arcangel's "Data Diaries." Zoë Salditch | Tue Sep 27th, 2011 6 a.m. 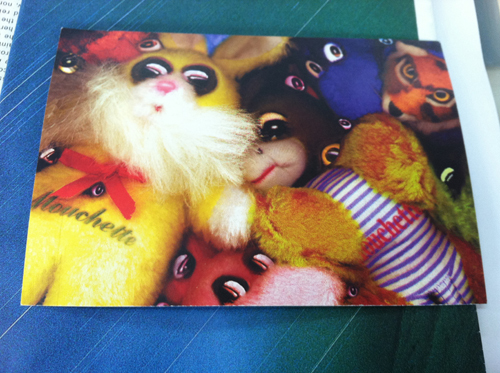 In a binder labeled "Rhizome Ads", a record of advertisements from various art and technology publications. I love the selling points here. 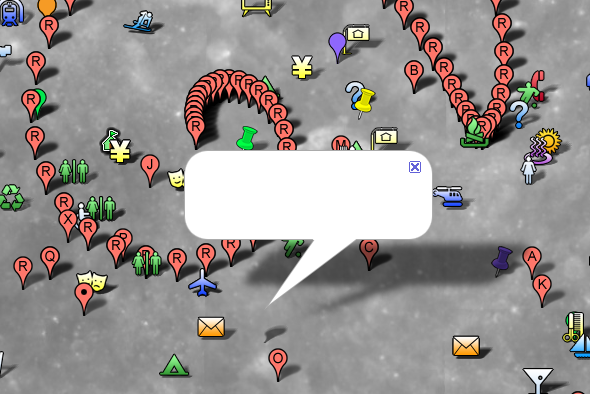 Starrynight search interface -- Amazing! 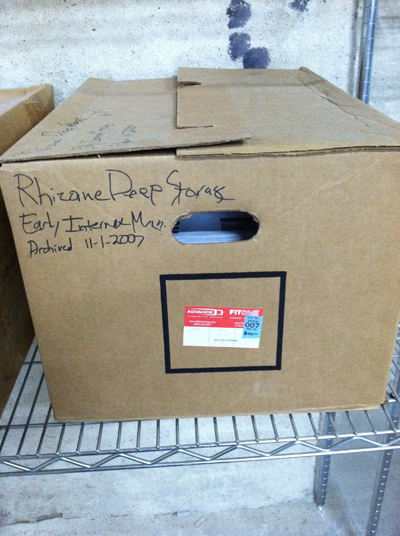 We also found a bunch of folders labeled by month and year which held articles about various artists involved with Rhizome, new media art calls, opening invitations and other ephemera. 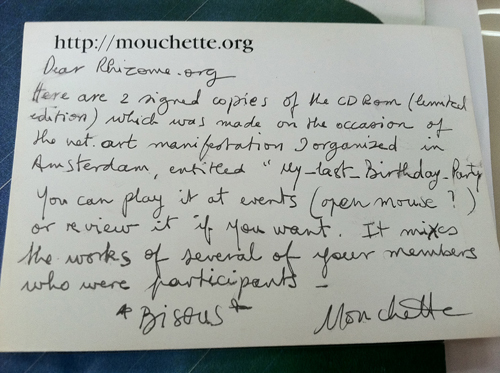 Flipping through, I came across this great hand written postcard from Mouchette. 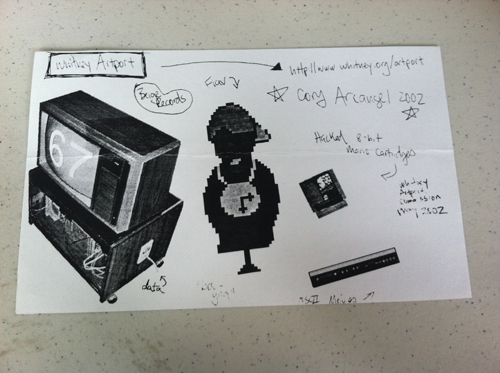 In another folder, I found this Xeroxed announcement for Cory Arcangel's Whitney Artport commission. There are over twenty-something boxes to go through, who knows what we'll find next. I promise to keep you updated! Ben Fino-Radin | Tue Sep 20th, 2011 3:56 p.m.
For my maiden post on the Rhizome staff blog, I’d like to highlight some recent developments and changes in the ArtBase. First and foremost, it is my pleasure to announce that Rhizome is a new member of the National Digital Stewardship Alliance. This consortium devoted to the longevity of digital materials consists of a diverse range of institutions, from non-profit organizations such as the Internet Archive, and ArtSTOR, to academic libraries and research institutions such as the Smithsonian Institution, Emory University Libraries, and Harvard University. We could not be more pleased, and look forward to complementing our own research with the aggregate experience of the more than 80 partner institutions. Ben Fino-Radin | Fri Aug 5th, 2011 11:06 a.m.
"…if nobody sees a museum piece, what’s the point of having it or keeping it? Museums exist for a social purpose, for us humans." Bruce Sterling, keynote address at “Preserving the Immaterial: A Conference on Variable Media,” Solomon R. Guggenheim Museum, New York, 2001. What happens when an institution acquires a digital work of art? How does one preserve and ensure the longevity of an art object that is inextricably tied to infrastructure built and controlled by neither artist nor institution? How can a work that exists in a social space, or makes use of real-time external data sources, be documented? These questions have long plagued collectors, conservators, and collecting institutions, as well as artists themselves. At Rhizome we face these challenges daily in our effort to preserve and ensure access to a multi generational practice and legacy of work produced by the communities we are built upon. 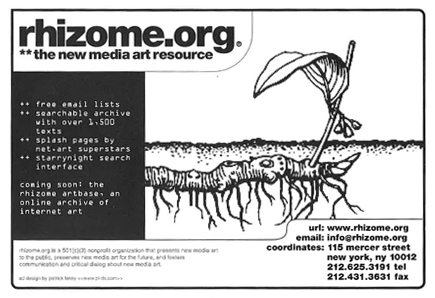 The first line of Rhizome's mission statement reads: "Rhizome is dedicated to the creation, presentation, preservation, and critique of emerging artistic practices that engage technology." Of these tenets, one that perhaps occupies the least public awareness, yet constitutes a significant portion of our labors ispreservation. It is at the core of Rhizome's mission of support. Natalie Saltiel | Tue Jun 14th, 2011 3:52 p.m.